Diabetic and nondiabetic Charcot joint neuropathy presents the need for orthotic designs to accommodate, correct, unload, and/or alter specific gait dynamics. The CLAW™ technology was developed to enhance the OWLS® WHO™ and shark-o™ designs by improving orthotic fit and increasing patient function. Triplanar adjustments allow quick and easy alignment changes to optimize each patient's walking characteristics. The CLAW allows for progressive adjustments to accommodate these many variables, and are all performed in the patient fitting room. Diabetic and nondiabetic Charcot joint neuropathy presents the need for orthotic designs to accommodate, correct, unload, and/or alter specific gait dynamics. The CLAW™ technology was developed to enhance the OWLS® WHO™ and shark-o™ designs by improving orthotic fit and increasing patient function. Triplanar adjustments allow quick and easy alignment changes to optimize each patient's walking characteristics. The CLAW allows for progressive adjustments to accommodate these many variables, and are all performed in the patient fitting room. Stop by booths 8 and 19 at the Academy Annual Meeting to view this technology. Dr. Marshmallow's LimbDefender™ post-op limb protector has a firm outer covering and a soft inner lining that protects residuum from contact, flexion contractures, and edema. The self-suspending design doesn't require any extra suspension methods. With six off-the-shelf sizes to choose from, the clamshell design is easily adjustable with scissors/knife if trimming is needed. Each LimbDefender ships with two light-compression, moisture-wicking socks, a removable distal end pad, and patient instructions. For more information, email limbdefender@gmail.com. X-tension is first to market with the development of a post-fitting/post-fabrication dorsiflexion limiter for custom AFOs. As part of LaunchPad's TRIO of innovations, X-tension works in combination with SNAPstop and PIVOT ankle joints to achieve desired shank-to-floor alignments and tuning optimization. The Formula foot is the ideal balance of flexibility and power. A first of its kind, the Pediatric Formula is a high-performance, customizable, pediatric foot that grows with the child. The long, lightweight carbon pylon provides critical energy return through the posterior attachment, while the compact shape of the ankle simplifies cosmetic finishing without hindering performance. The standard and custom Pediatric Formula feet are transforming pediatric prosthetics for kids who require exceptional performance and flexibility. Let them be little. Let them play big. PROSTHETIC RESOURCES: Spinal Technology, Inc.
Spinal Technology is the exclusive manufacturer of the Providence Scoliosis System, a nocturnal bracing system designed to prevent the progression of scoliosis, and the patented FlexFoam™ spinal orthosis. For more information, visit us on the web at www.spinaltech.com or call us at 800.253.7868. The All-Terrain Knee Premium is a high-functioning, waterproof, K2-reimbursable mechanical knee joint that fulfills the security needs of low-mobility users while still meeting the rugged demands of a highly active amputee. LegWorks' patented AutoLock Technology gives patients confidence on all terrains, while the patent-pending swing phase controller allows for variable cadence without the use of hydraulics or pneumatics. It is waterproof and corrosion resistant (in pools and salt water), highly durable, and weight rated to 330 lb. (150kg). A simple twist knob manual lock allows for absolute stability in or around the water. One-stop fitting for nonstop living. People with lower-limb amputations don't want anything to get in the way of truly living. That's why today's leading prosthetists are offering greater mobility with a new transtibial system from iFIT—Immediate Fit, Innovative Technology. Our unique adjustable design affords one-session fittings for persons with limb loss, getting them back to their adventures quickly, safely, comfortably, and affordably. Functional restoration is the process; physical rehabilitation is the product. Technology is the means by which clinical prosthetists restore a functional balance between neuromuscular and neuropsychological kinematic function. Dycor products are designed and priced to go hand in hand with existing coding and reimbursement policies that best facilitate this rehabilitation goal. K Series and H Series feet are an excellent example of this bioengineering philosophy. 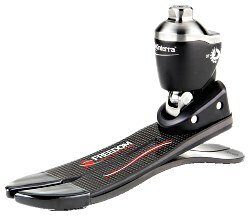 Simple, lightweight, durable and inexpensive, K Series feet control kinematic heel/forefoot biaxial function and H Series feet control heel/ankle/forefoot triaxial function. Reduce remakes, reduce refitting events, and improve your business. Adjust with RevoFit™. RevoFit from Click Medical creates adjustability in any socket so patients can instantly adjust the fit and feel of their socket. It's simple: You build it; they adjust it. Want to become an adjustability expert? Sign up for our free "Can You Adjust" educational program at www.clickmedical.co. The ALPS Skin Reliever ENCP eliminates shear forces, friction, and prevents abrasions on the skin of the residual limb. 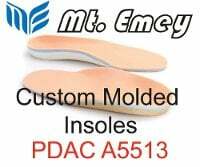 It offers superior comfort and durability while also accommodating for volume fluctuations over the life of the prosthesis. The ALPS Skin Reliever provides superior elongation for very little compression against the skin, reducing shearing and abrasion. There is no need to make a new socket for this product, as the ALPS Skin Reliever can be worn under silicone and gel. For more information, call or visit our website. Finally, an unprecedented elevated vacuum system that seamlessly integrates effective vacuum with the same rugged simplicity of all the RUSH Foot® designs. The RUSH Foot EVAQ8® Collection is the easy solution to providing maximum vacuum efficiency in just a few quick steps. No batteries or complicated mechanical pump required. Unlike the competition, upwards of 22 inHg can be achieved with this surprisingly simple integrated design that stabilizes volume, increases linkage, and heightens proprioception through elevated vacuum suspension. The RUSH Foot EVAQ8 Collection is all-terrain, fully submersible (fresh or salt water), free of bulky components, and requires minimal maintenance. The RUSH Foot EVAQ8 Collection is available in the RUSH LoPro, HiPro, and ROGUE models, providing the perfect option for the majority of individuals seeking elevated vacuum suspension. American Association of Breast Care Professionals, a national organization founded in 2004, is dedicated to the representation of post-mastectomy care professionals. Developing post-mastectomy standards of care and education, AABCP provides all levels of educational opportunities: basic fitter certification, business, regulatory boot camp, and the annual Global Breast Care Summit & Expo. Believing that trained, certified providers provide optimal care, AABCP maintains a public advocacy and awareness campaign through social media. AABCP strives for a sense of community between stakeholders, insurers, politicians, organizations, and professionals fostering academic partnerships and supporting statistical surveys outcomes research to better serve breast cancer survivors. We found you can save at least 31% by using Coyote Composite compared to carbon fiber. For a list price and a more comprehensive list of reasons why you should switch to Coyote Composite, visit our website. Introducing the new Iceross Seal-In X-Classic, Seal-In X-Volume, and Seal-In X-Grip movable seals. For use with the Seal-In X and Seal-In X TF liners, these seals feature an improved textile donning aid, and Easy Glide low-friction coating making donning the socket easier without the use of alcohol or lubricant spray. Improve your patients' skin and limb health, control volume, and reduce pistoning and rotation. Seal-In X provides personalized, optimal fit and secure suspension. Recommended for use with Unity sleeveless elevated vacuum for excellent volume control and suspension. Ask your Össur rep about a demo or visit www.ossur.com/dynamic-solutions.